As much as I like the city of Dalat, it’s the surrounding landscape that most appeals to me whenever I make the journey up to this part of the Central Highlands: purple mountains cloaked in pine forests stretching into the misty distance, the smell of wood smoke and coffee blossom scenting the cool air, and the stillness and silence of an alpine landscape that most people wouldn’t normally associate with tropical Vietnam. 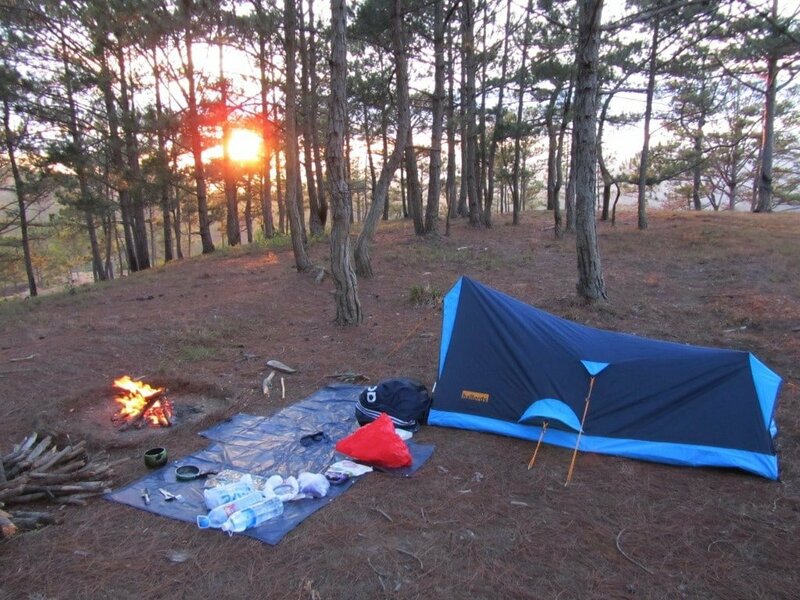 For me, by far the most rewarding way to experience this region is by camping in the pine forests north of Dalat. Why Camp in Dalat? The first time I came to Dalat, in 2005, I remember my excitement building on the bus journey as the road climbed higher through jungle and mountains, only to be disappointed on arrival, when I realized that very little of this landscape is visible from the city itself. What was the point, I wondered, in travelling all the way up into the mountains if, once you arrived, there was no sensation of being there? Of course, most visitors to Dalat go on excursions to waterfalls, lakes and valleys within easy reach of the city. However, because Dalat is such a popular destination for domestic and foreign tourists, these nearby scenic sites are often (but not always) heavily commercialized, busy and underwhelming. To really immerse yourself in the natural setting of this area, rent some wheels, ride a short way out of the city, find a spot in the forests, and camp. Where to Camp? 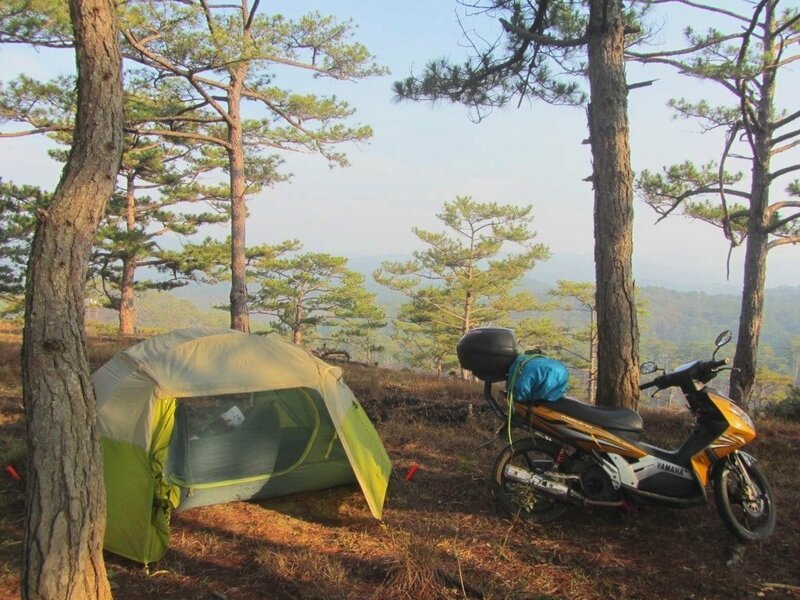 Rent a motorbike or bicycle from your guesthouse or hotel in Dalat and ride northwest out of town on the Pine Tree Road. After 35km this leads to Hồ Suối Vàng (Golden Spring Lake), a popular picnic spot for domestic tourists. Scenic enough but blighted by appalling trash left by picnickers, continue on the Pine Tree Road past the lake, heading due north. The road immediately starts to climb into dense pine forests and continues to meander through them for at least fifteen kilometres, skirting the boundaries of Bidoup Nui Ba National Park. Look out for dirt tracks leading off the main road and into the forest. Take any one of these tracks and follow it until you find a good campsite under the canopy of pines. What is a Good Campsite? The pine forests here are great for camping: the carpet of fallen pine needles is soft to sit and lie on, the pine trees offer shade from the sunshine during the day and shelter from the cold, wind and rain during the night, and there’s plenty of dead wood lying around for making a small fire (although obviously you need to be very careful, especially in the dry season, as pine is very flammable). Personally, I like to camp on the ridge just north of Ho Suoi Vang (which I’ve come to refer to as The North Face, in honor of the brand of my tent), but there are plenty of other good spots too. Choose your position carefully. A good campsite in this area is one with easy access to the main road (in case you need to make a quick exit because of bad weather or any other unforeseen circumstance), but preferably not in sight of it. This is because you don’t want to attract the curiosity of any passersby (of which there are very few anyway). In general, try not to draw attention to yourself: wild camping is still quite unusual in Vietnam, so anyone who sees a foreign traveller setting up their tent in the middle of the woods will naturally be curious, or even, in some cases, suspicious. Try to make sure no one sees you riding into the forests from the main road, and make sure you choose a campsite that is both in a commanding position – where you can view your immediate surrounds – but also relatively hidden from view. Remember that, at this altitude (over 1,500m), the nights can be surprisingly cold. Don’t pitch your tent in a position exposed to the wind, but also bear in mind that, if it rains during the night, you don’t want to be at the bottom of a slope where all the runoff rainwater will flood your campsite. What Equipment Do I Need? Make sure you come prepared because, once you leave Dalat, there are very few shops in the area. This is ‘wild camping’ so you’ll need your own tent. 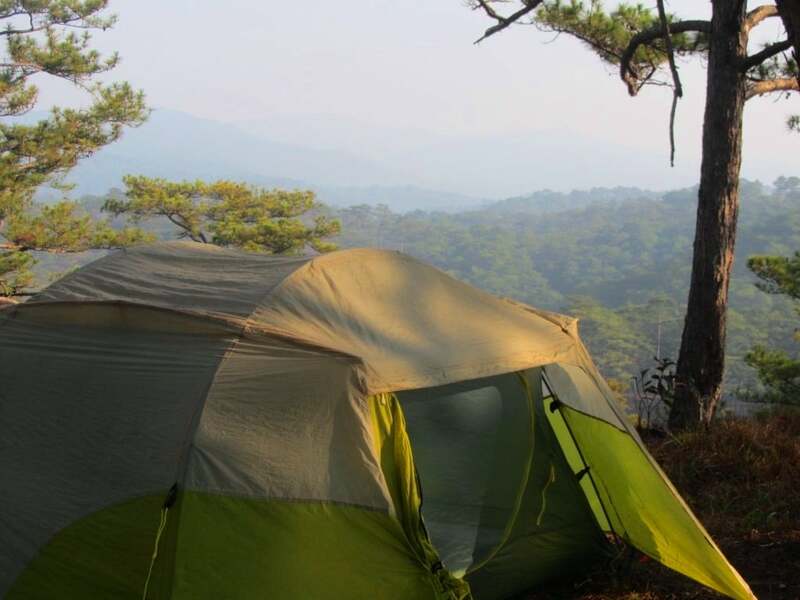 There are a few decent camping stores in Saigon, such as Fanfan, but you should also be able to find a tent for sale or to rent in Dalat if you try hard, but the cheaper tents are very unlikely to be waterproof (however, this shouldn’t be an issue during the dry season: December to March). 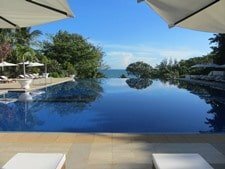 You could start by asking at your hotel or perhaps enquire about it at Phat Tire Ventures. You’ll need a small camp stove or something to cook on over the fire, lots of bottled water (5 litre bottles are available in general stores in Dalat for 25,000vnd [$1]), some food supplies such as instant noodles, coffee, fruit, chocolate (nuts are a good camping snack), a torch (flashlight), warm clothing and a sleeping bag or thick blanket – remember it gets cold in this area at night, no matter how warm it feels during the daytime. Having something to sleep on is also a good idea: the ground can be cold, hard and uneven, so having something soft and insulating between you and it makes the difference between a comfortable night and a sleepless one. Most importantly, bring something to put your rubbish in. Sadly, many domestic travellers neglect to do this: set an example by making sure you leave your campsite as you found it. For peace of mind, it’s good to have a lock for your motorbike or bicycle so that you can secure the wheels and leave it near your tent during the night. Lastly, bring a bottle of the local mountain brew to keep you warm and jolly under the night sky. Rice wine (rượu in Vietnamese) is very popular in the highlands. In particular, I like the flowery, fruity, strong flavour of rose myrtle rice wine – ask around or look out for signs by the roadside saying rượu sim. When is the Best Time to Camp? The best time of year to camp in this area is the height of the dry season, from December to March. During this time the weather is perfect for camping: dry, warm (but not too hot), sunny and bright. However, the nights can get very cold (single digits Celsius on some occasions) and the early mornings are misty and damp. During the summer months (June to September) rains can spoil the fun, although nighttime temperatures are warmer. Is it Safe? 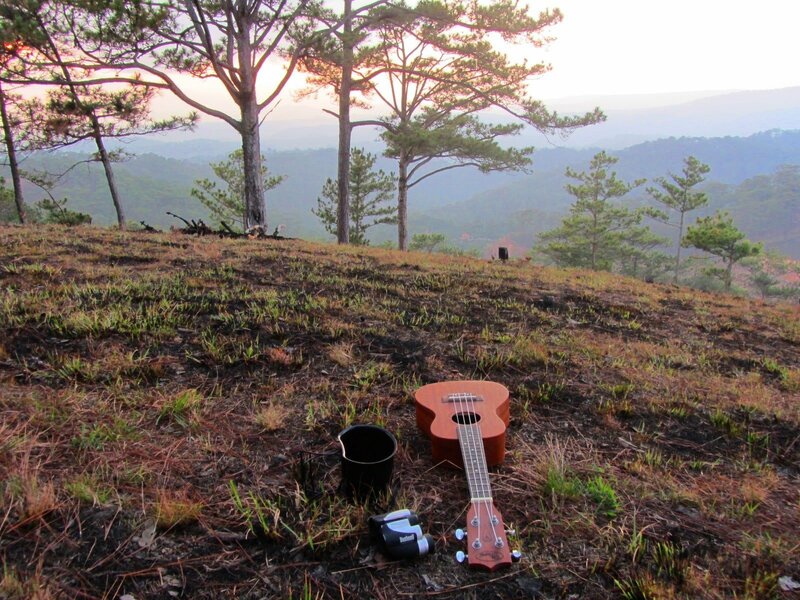 I’ve camped in the pine forests north of Dalat many times over the years and I’ve never had a bad experience. On one occasion, my friend and I were forced to abandon our campsite in the early evening, because it had rained steadily for 5 hours and we’d carelessly pitched our tents at the foot of a hill, so that the rains ran down and flooded them. I was once disturbed (and terrified) during the night when I heard heavy footsteps approaching my tent and saw two giant shadows moving outside, only to discover that they were a couple of beautiful buffalo. I’ve never had a problem with local authorities: one time, a forestry worker walked by my campsite, I asked his permission to camp, and he said it was fine as long as I did so responsibly. When you go to sleep, make sure you have all your most valuable possessions with you inside the tent, and don’t leave food out during the night. In general, if you come prepared and use your common sense, you should be fine. If for some reason you need to bail out in the middle of the night, Dalat is only a 45 minute ride away by motorbike. Is it Fun? Whether camping alone or with friends, chances are this will be a night you’ll remember. I like to find my campsite around mid-morning so that I can pitch my tent, collect fire wood and organize my things. Then I spend the day in the dappled sunlight under the giant pine trees, watching the colours change over the mountains, reading, snacking, chatting, playing the ukulele and singing until sunset. I make a fire at dusk as the sun is disappearing behind the ridges to the west. When darkness falls it’s always a surprise to find that mine is not the only fire in these forests: half a dozen other flickering orange lights appear in the landscape around me – a reminder that some people in the Central Highlands (mostly ethnic minorities) still live semi-nomadic lives. When the night gets cold I lie by the fire, watching the stars and thinking about the animals that once inhabited these forests: travel writers in the 1950s wrote about wild tigers and elephants being a daily concern for locals, who avoided walking from house to house in Dalat at night for fear of an animal attack. Today, however, the only large wildlife you’re likely to encounter are buffalo, which can still be a pretty scary sight in the middle of the night. 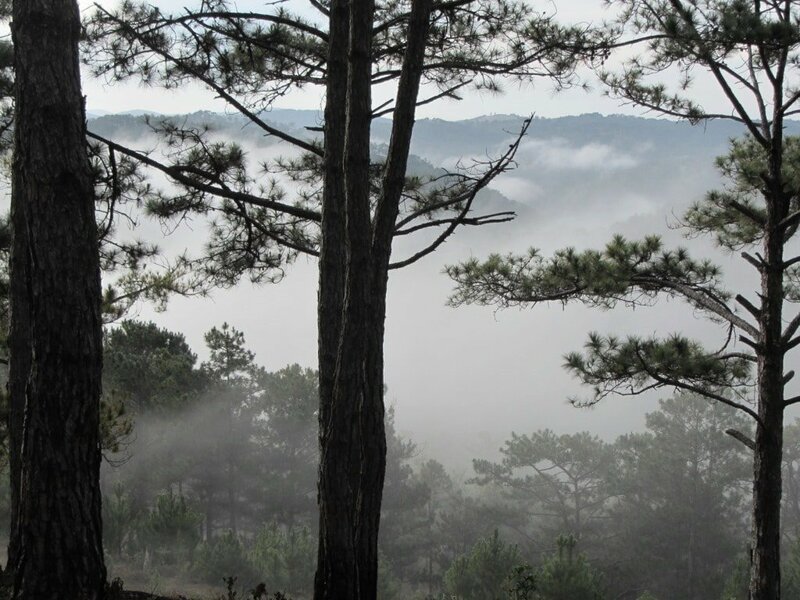 The thing that stays with me the most from my camping trips in Dalat is the sound of the wind through the pine trees at night – a sound that is at once haunting and comforting – and the good times I’ve spent camping here with my friends, staring up at the stars and drinking rice wine together. 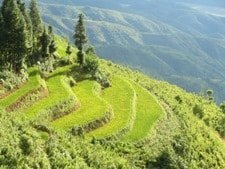 This entry was posted in ALL, Camping, Central Highlands, Dalat, HOTEL REVIEWS, Mountains, Off Beaten Path and tagged camping, central highlands, Dalat, guide, travel, Vietnam. Bookmark the permalink. Do you know much about the legality (and the “legality”) of camping in VN? Most of the issues I’ve run into in the south-central highlands revolve around being out and about (even with proper paperwork) in the forest and staying in places I shouldn’t be staying. Border areas are particularly sensitive, for obvious reasons. But apart from that, I’ve never encountered problems with local officials. If and when I come across an official, I ask permission to camp, and I’ve not been refused so far. 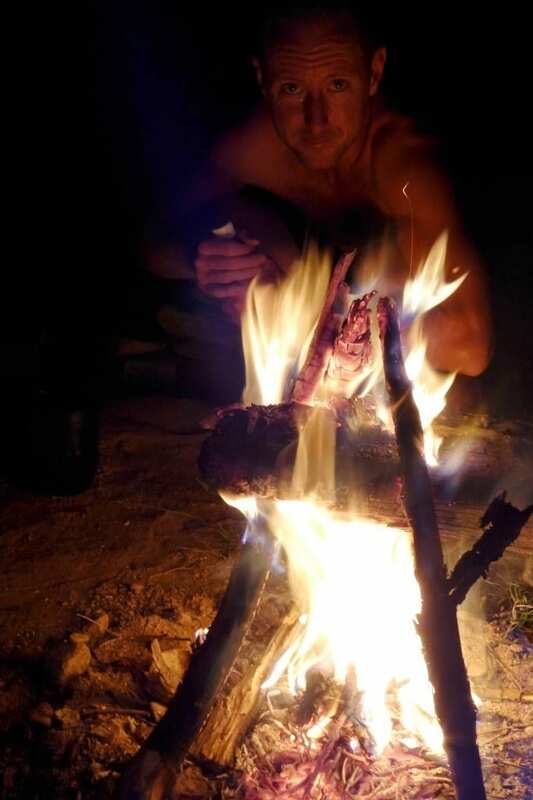 I don’t know about the legality of camping in the wild in Vietnam – but it sounds like no one else does either: my Vietnamese friends are under the impression that it’s allowed as long as it’s not in politically sensitive areas or on private land. Either way, wild camping is still unusual in Vietnam, so it’s best to be as discreet as possible, and if people do see you camping just politely ask if it’s OK to camp there or not. I’ll read this post more thoroughly, and in the meantime I wonder what you think about going there this time of the year. I’ve never been up in Dalat in the rainy season. 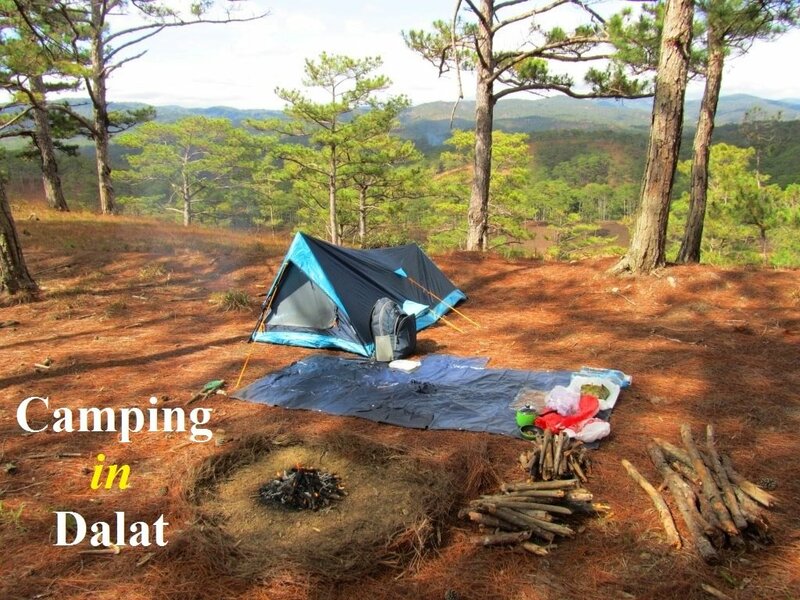 Yes, I think it’s still worth going up to Dalat, even in the rainy season, to camp. It doesn’t rain ALL the time, and more often than not it’s slow, steady rain, rather than the tropical downpours you get along the coast. However, you should definitely make sure you have a good, waterproof tent. The tent is a pretty solid Jack Wolfskin. That should do the job. Thanks for your words of encouragement. First off great site, well designed and very informative. My girlfriend and I are traveling SE asia and are getting ready to motorbike Vietnam from Saigon to Hanoi. We both love camping and have been trying to find reliable information on camping during our ride. Here is my question, we didn’t pack and camping supplies and we are on a budget, we would love to camp but want to know if there is enough camping opportunities along our ride to make it worthwhile buying a tent and a little stove? Any advise is welcome, Thanks. It depends on which route you take really. Camping is increasingly popular in Vietnam, and many cool campsites have sprung up over the last few years. But these are concentrated in certain areas – see my guide to Camping the Ocean Road for example. There are more opportunities for ‘wild camping’ on the mountain roads than on the coast roads. This is mainly because the coast is more built-up and developed than the mountains. On stretches of mountain roads, such as the Western Ho Chi Minh Road from Khe Sanh to Phong Nha, there are lots of great places to pitch your tent for a night. 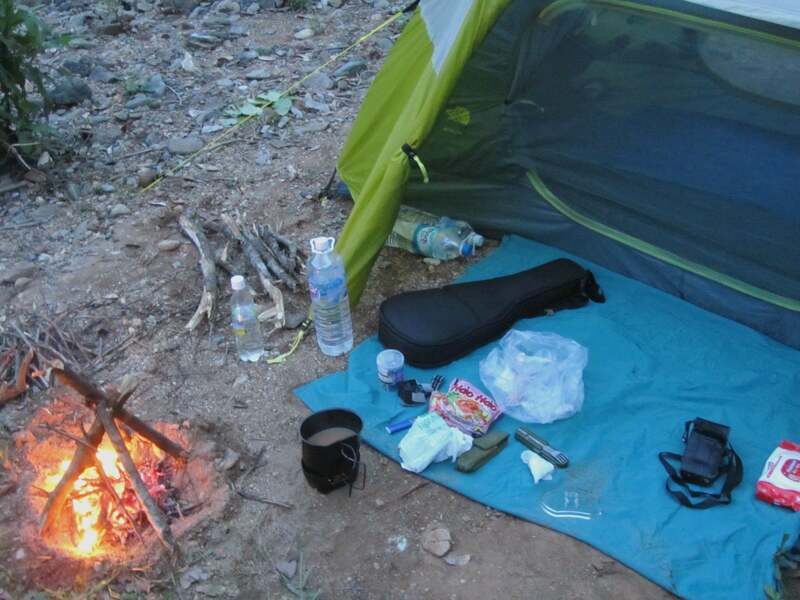 However, you should always be careful when ‘wild camping’ in Vietnam: it’s not very common so you may attract attention and possibly suspicion, so make sure you are as discreet as possible and that your campsite can not be seen from the road. Also, don’t just wander off into the jungle. Another thing to consider is time – if you have plenty of it, then I think it’s definitely worth bringing your equipment along with you and trying to camping as often as possible. But if your time is limited, it’s probably not worth it. Remember, you can almost always find decent budget accommodation wherever you are in Vietnam at nhà nghỉ which are local guesthouse – more about that here. I am on a bicycle trip around SE Asia, just arrived in Vietnam and plan to bike from Saigon to Hanoi. I know it might not be the best season, but I want to do a bit of camping. Do you know where to buy fuel for my camping stove in Saigon? And the name of it? So far I havn´t found any. I have a Trangia, but lost my fuelbottel. Try at one of the places I mention in my Camping the Ocean Road guide here. You’ll find links to two places in Saigon under ‘About Camping on This Route’. Fanfan and Leu Du Lich are their names. 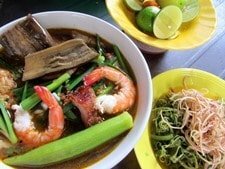 You could also try U Best on Bui Vien Street. Thanks for your reply. I already went to Fan Fan, but they didn´t know about it. I will have a look at the other shops. Thanks for sharing all the cool stuff here! My boyfriend and I are flying into Da Lat and out of Nha Trang and want to do the motorbike ride from one to the other. Do you know anywhere in Da Lat that offers one-way motorbike rental? Any advice you have would be much appreciated! I don’t know of a specific place that hires bikes one-way but I don’t think it will be difficult to find because this is quite a popular one-way ride to do. Just ask at your guesthouse or hotel in Dalat. Thanks for getting back to me so quickly Tom. I’ll let you know if we find a particularly good company to with :). I found your blog at the right time. This is an amazing blog. Thank you for your time and effort to put all the info for fellow travellers and inspiring others is the most important thing in life. So I said I found you at the right time. I’ll be backpacking in Vietnam for 3 weeks starting from 26th January 2016. I am a solo female traveler and I wanna do a motorcycle trip from Ho Chi Minh to Hanoi. 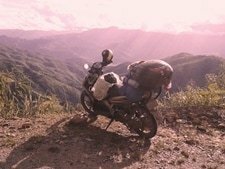 My questions are: 1-) what do you think about doing solo motorbike trip and camping as a solo female traveller? 2-) have you seen any dangers that I should absolutely avoid? 3-) do you know any local contacts in Vietnam to help me buy a motorbike? 4-) i have never driven a motorbike accept a scooter, so which type of motorbike should I get? 5-) before starting the journey what info I should learn about motorbikes as a must? 6-) do you know a local school that I can volunteer for couple of days and help them to raise funds? I am not interested in big NGOs as they are already well-known but small ones and local schools need exposure to get volunteers and funds, if you knew and could share, I would appreciate so much. I am looking forward to hearing from you. Thank you so much. and Ho Chi Minh City in the Pham Ngu Lao ‘backpacker’ area. Yamaha Nouvo (like mine here) and the Honda Air Blade. I have written about. But they are more expensive than other bikes. happens just find the nearest person or house and they will help you. 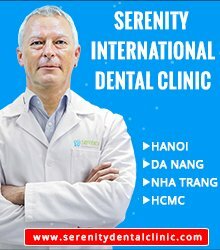 Foundation in Saigon and asking them if they can recommend somewhere. Thanks a lot for your reply. I’m looking forward to enjoying this wonderful place. I’ll let you know later about my experience. Thanks a lot for the information you shared with us. It’s very helpful for everyone, especially for those who want to go a bit further in travelling and not just staying on the beaten track. I’ve been living in Vietnam for more than two years in Binh Duong New City, I teach English at a university here. It’s a very nice place to live. As I have a short holiday, I decided to go to DaLat for 4 days, arriving on Friday 18th early morning, at abut 5:30 am and leaving for Saigon on Monday 21st at night. I’m planning to go camping, so I’m going well equipped. I’m taking with me a tent\hammock\sleeping bag and cooking gear. I did some research about were to go and I came across your blog. I want to visit some waterfalls and camp there as I go, I was wondering if that is possible. I’d like to avoid guest houses or hostels where possible. I also want to camp in the pine forest you posted, it looks great. 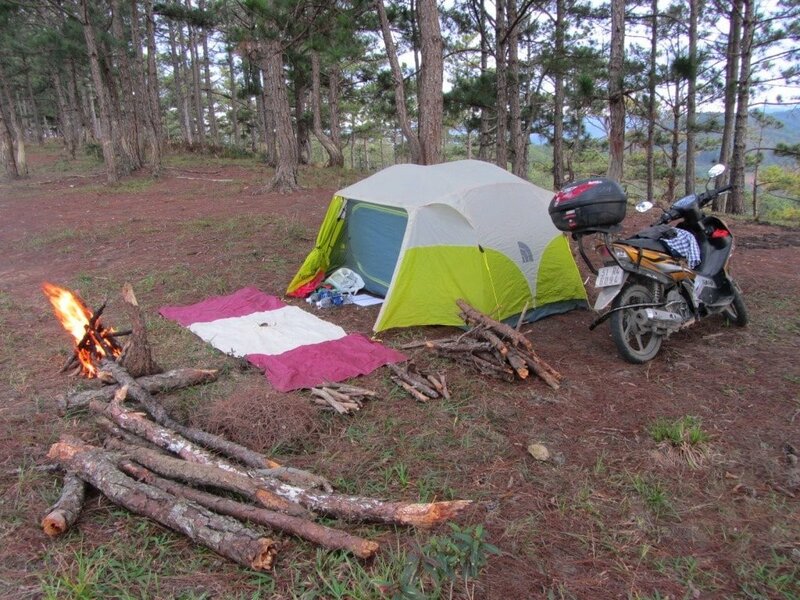 Did you leave your motorbike next to your tent? My idea is to rent a motorbike as soon as I get there and return it before I leave, so any info about renting bikes will also be appreciated. 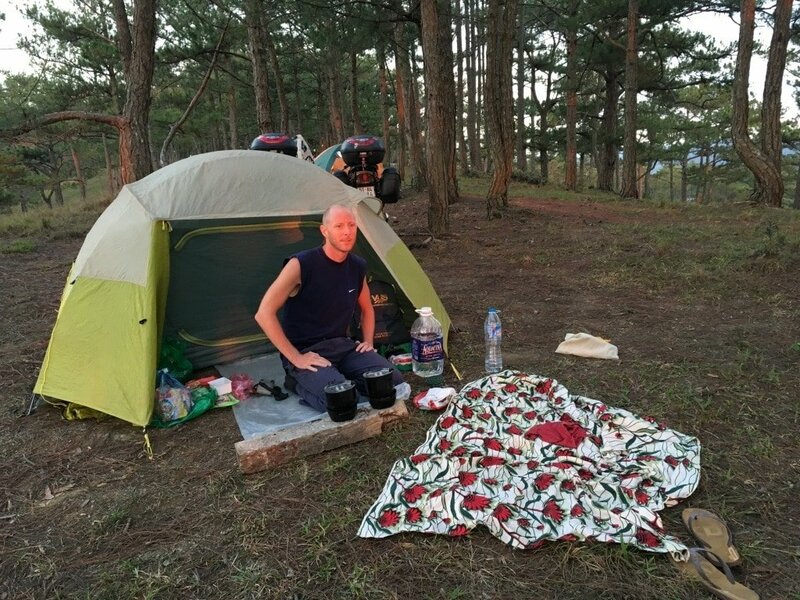 Yes, camping in Dalat should be possible and nice at this time of year. However, because you are going to be there on a weekend some places may be a little busy. For example, the waterfalls can be crowded on weekends. 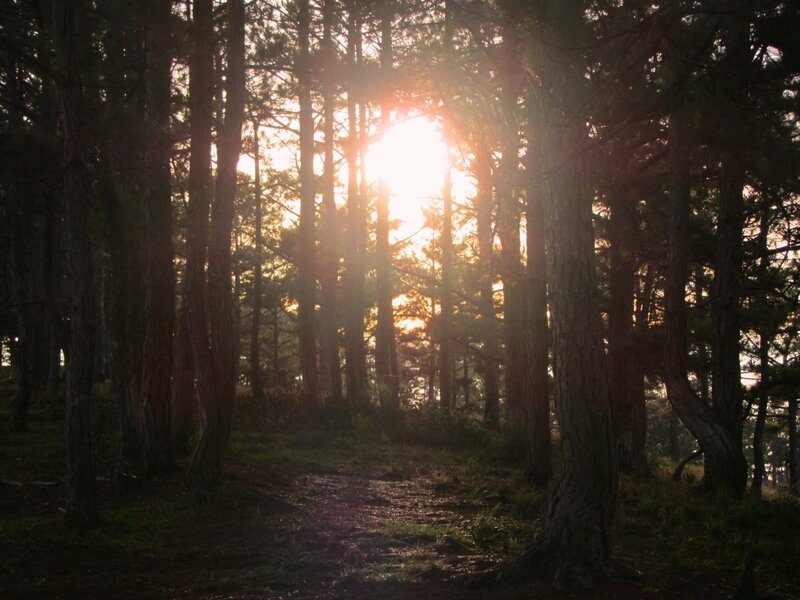 The pine forests where I camped are great. Yes, I parked my motorbike next to my tent at night. But I made sure the bike was locked and secure and that it was visible from my tent. I can’t recommend anywhere specifically to rent motorbikes in Dalat, but I’m sure it will be easy to find one, especially in the backpacker area around Truong Cong Dinh Street. At some of the waterfalls it is possible to camp – empty ones like Bo Bla and Gougar are OK. You can ask to camp at Pongour. And there are good pine forests around Tiger falls and Bao Dai falls. 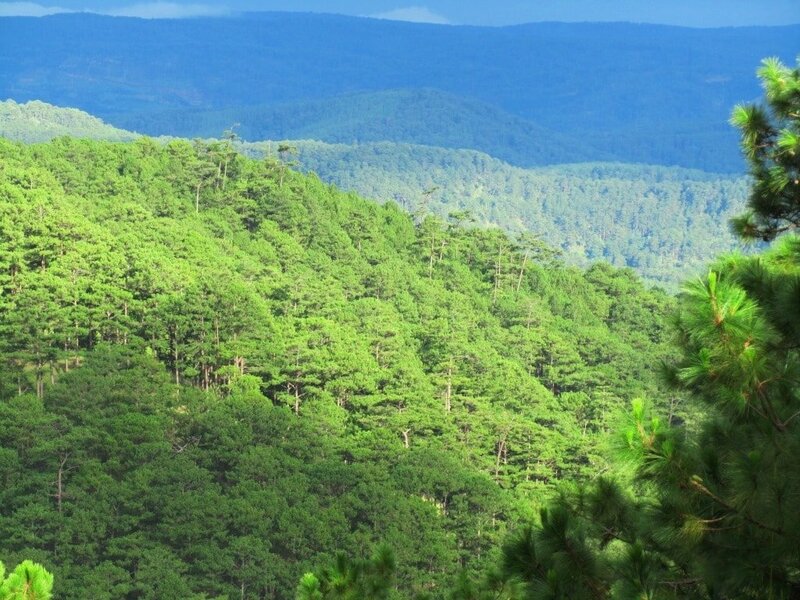 In general, pine forests around Dalat are great for camping, but try to be as invisible as possible – obviously a foreigner camping in the forest will attract attention – and you don’t want that when you’re camping. When camping at the waterfalls, it’s best to ask permission from some one first – often they will agree. Thanks for your answer, I did some research and this shop look great to get what we need for the trip. We are use to camp on our travel here in France, always leave the place as clean as we found it. I heard it can get pretty difficult to camp on someone land in Vietnam, we are more thinking about only camping on the beach or in forest along the Laos border. Thanks again for your work on this blog. 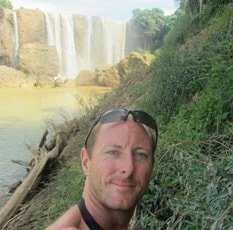 I’m Yann, my girlfriend Amanda and I are coming to vietnam in January and we want to travel from Saigon to Hanoi on motorbikes. We wanted to thank you for the effort you put into this blog, it as been very helpful for planning our trip. We decided to follow your tracks from Saigon and head to Hué, then climb up in the mountain. We just wanted to now if you have any recommendations of where we could find camping gear (tent, sleaping bags…) in Saigon, and if it is easy to find camping spots along the way? Camping in Vietnam is good fun, but you should choose your site carefully. It’s best if you are not visible from the road. And, of course, make sure you camp responsibly: don’t leave any trash and don’t camp on some one’s land unless you get permission from them first. Remember it can get quite cold and raining in January in places north of Nha Trang, like Hue.